The FB2XLGG2@A10GX1150 is a high-performance OEM hardware platform with Low Profile Intel® Arria® 10 GX PCIe board which provides to customers an off-the-shelf Best-In Class hardware solution for HPC or Networking applications. The board hosts 1 bank of DDR4 and 4 banks of QDR2+ memories and two QSFP+ cages for multi 10GbE/40GbE networking solutions. 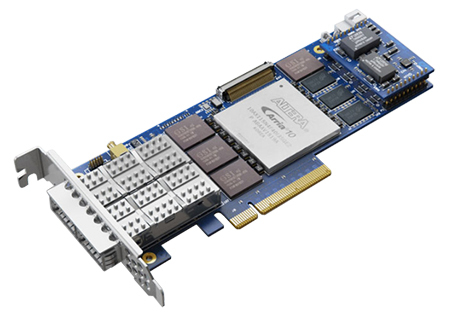 The XpressGXA10-LP1150 high-end board allows all engineers to design complex applications using PCIe and 10 Gigabit Ethernet as their main communication interfaces. The GXA10-LP1150 is a low-profile, highly-integrated PCI Express FPGA board with quad-10G or 40G Ethernet channels engineered for both prototyping and field deployment. On board programmable PLL oscillator (Si5341), highly flexible and configurable clock generator/buffer. This component provides special and high quality clock signals for high-speed transceivers and memory FPGA controller.